I am from the Bafumbira tribe on boarder of Congo/Rwanda & Uganda but they are definitely Ugandan’s! Me & my mum are not ok together. I became tough because I didn’t know my relatives and I tried asking about my father but she didn’t tell. In 2013 mum told me my father was dead…. this was the 6th time to see her in my life. So I asked her to show me where I belong. There are 8 siblings on the side of my mum. Mum said my father & my grandfather are not easy people –when you were born they didn’t give you any help so be careful. I asked her to go find them with me, but she didn’t agree. My mother stayed in Kamwokya. I went alone, to go in a place where I have not one I know. I got a ticket and spent a day on the way in the bus. I reached there at 5pm on the streets of Kisoro (south west). I was in fear because it is Christmas Eve and I might have money for one to steel. I bought 1 telephone and paid 50,000 for bus to go there. First I waited but at midnight I got a buda buda (motor bike) because I could not wait anymore, but I was in fear. I held the guys jacket tightly –I thought ‘if we die, we die together’. Whatever he was doing or saying I was in fear, since the place where we were was deep in the bush, and I feared it was the wrong way. We reached the place and he called out to anyone. There appeared a woman coming out from a brush fence. I had a torch on my phone; I shone it on everyone in the face so I could identify them. The woman took me to the right place -I saw the mountain and realized I should be around mountains, but I was not alright so I told the buda guy to take me back. He said we couldn’t because there is a gang of boys that kill these buda guys. I didn’t know their language, so the buda guy helped me with translation. The woman was my grandma but I didn’t know her. It was as if I was just a stranger. I found many people there. I thought I was just an only person but I was wrong. I found their 4 siblings and I was the oldest. At midnight they asked a lot of questions. My mother gave me a picture to show them with the name of my father and this was the only name I had. They realized I was the one. They were not interested in my story yet. They told me to enter, but I was still in fear that it was not safe and there was a hole for them to put me in. I feared if I sat down I would drop in a hole. There is a story that cannibals dig big holes in their houses, they put a mat over the hole covering spears that stick up. They put a light chair on top of the mat and when it rains the people rush in for cover and they sit in the chair –they become dinner! That place is too cold. First they gave me a big jacket, but I couldn’t trust them at first. Then they gave me a seat –I remained standing “you sit so we can hear your story’. I remained standing. When it was morning they gave me a room -first I searched the room, then I closed it, but it was not allowed. I got sleep until 11am. It was now Christmas day and they had prepared rice, beans and meat –but I asked myself if I am going to eat a person. I told them I don’t take meat and I don’t take soda, so I couldn’t take whatever they gave me, but as time went on I became so hungry so I went back to them and asked ‘can I cook for myself?’ They took me to a Trading Centre and they bought matoke (plantain) & rice. Then to the market and they said you get whatever you want –they are asking what do you want and there I met a lot of people. They told me he was not a good father, he left me behind and couldn’t care about me. My mother told me he died of Aids, but then my sister told me no he got stroke and some body parts were not working. Then I think why is she lying –then it caused hatred, ‘why is she doing that?’ (many still do not accept death from HIV Aids, hence the cause of death is often covered up). I was so amazed I couldn’t believe in everything. I have family friends, relatives and sisters and grandparents –even those ones that I had met in the city said ‘we didn’t know anything about you’. I was with my mum (foster) until 13yrs –she caned me everyday. Then I began to know myself. The neighbour’s told me there is a woman that comes as a visitor –this one that is caning you is not your mum. I didn’t believe them. I was working too much. I go to garden, I get food, then I fetch water -3 jerry cans of 20lt for a cow and the water was not near -about 3 km away. Sometimes I was so tired I would stay at the well and play with other children. I was 9yrs when I began to take the jerry cans; I was so short because of those jerry cans. So I waited to ask my mum about the lady; I waited for a long time and then one day I came back at midnight, because she was punishing me. So I told her you are not my real mum, and I am tired of the caning. Then she told me do whatever you want; I said you will never ever cane me again because you are not my real mum. Then I left and went to my friend. When I came back the next morning she told me I will not ever cane you again. I was in school, it was 2005 –Primary 4 and they contacted my real mother for money –she said I have no money, but they demanded payment of 2 terms. I was in the classroom and they were making role call for completed payment of school fees, so they told me go back home until you bring fees. There I stopped schooling. I used to admire the friends who are wearing the uniforms …I was so bored at the village. All the friends I had went to school in the city. Sometimes I could steel to get food and sometimes I would sleep in places you are not supposed to sleep. My friends told me in the city the money is for free. I came in the city to collect the money in the street, where it fell from the trees. I really believed them. By the time I was 14, I got a plan that if I got money I can go in the city or maybe I can get a lift on the lorry that carries the banana to the city to pick the money. I went to my mum’s (foster) house – by that time I was not staying there. I stayed with a family that was caring about my mum beating me everyday. But I was still bored when no one was around. When it was the season for mango’s I could sell and I even had a boss – I would get 500 shillings (20cents) per day. I went in the house of the family and searched for money because I knew them well and I knew they would hide money in the dust or under the mat. I found they had transferred the money to another place. Then I found a suitcase with a lock –how come these people have a lock. Then I knew there was money. I looked for keys and found nothing so I got scissor to the teeth of the zip and I found coins and some papers in a box. I got fear because if they found me they could take me to the police. You know that cow it was crying as if someone was coming. As soon as I heard the cow I ran from the house and I was not sure where my mum went. I went outside to see but no one was coming. I got the money and paper, so I collected everything from the box -100,000shillings ($40) -it could even buy land. I was in fear I was shaking, but I didn’t know the garden where my mum was digging. So I put saliva on my palm and where the wind took it is the way I would go. The friends of my mum were there so I was passing in the bush. I passed in the town but even the neighbors were there so I had to hide. I saw a car and ran to it. I had to break the box because it was like wood, then the coins were really heavy and I packed the coins and papers into the box, so I waited for a taxi to take me to the city. I took a cake, a rolex (chapatti wrap) and then I got soda for waiting but I didn’t get time to eat because the taxi (minibus) reached. The conductor thought someone was with me but I said no I am going to Kyabadaza –the conductor said are you really going there or somewhere else. I didn’t answer. They asked are you meeting anyone you know, but I was so short they said we know you are escaping from where you have been. I was shaking with panic –they knew I was going to the city (Kampala). You are still young so we will charge you just 2000shillings (75cents) –where you are going is not a safe place and you will be killed for the money. They said what are you going to do and I answered ‘ I am going to sell bread in the taxi park’. We arrived and I was wondering; so many cars, tall buildings and many people and I thought I am going to collect money. I said to the taxi man I was getting money. He said where are you going to collect money, where do you think you can get money from in this city? He laughed, but I thought if you don’t want then you don’t have to tell me. The taxi man said separate your money so if they take it you still have some, but I forgot. I bought 4 breads for selling for 2300/= and I had to sell for 2400/=, but because I was not good at trading the person would ask how much is the bread? And I would tell them it was 1200/= because I could not calculate money. Then I had to see how the city looks or to get a place to stay, but the problem I used to face was, the park was full of advertising posters so I had trouble to find the right place to keep my money –(money is usually hidden buried in the ground or a safe place). Then I went out of the park to Mapera House to see how it looks and when I came back to the park it was a big problem …it was 9pm. I labeled an advertising poster but it was MTN and there were many posters the same. I went to one and then another and then I thought they took my money –It was gone. As I was on the street standing my neighbor found me there near Centenary Park. He told me we are going back to Kisoro and I had not choice. I had no money, food, shelter, but I feared those angry with me could cut off your head. I said ok I go with you; I was tired of the city life. He contacted the parents and said ‘can I bring him back’ but they answered ‘leave him there so he can face the world’. I told him ok. The first week, then the second week and then I found the woman, she was an Acholi, from the north –she found me on the street but I thought she was this one chopping the head. She said if you want somewhere to stay, there are people like you. KIN –I found a lot of children it was 2007. Jo & Steve began supporting Shalom Charity Foundation in 2007; Shalom was to take over a rundown and failing KIN (Kids In Need). This is when we first heard of Godfrey, but it has taken 8 years for us to gain trust where he wanted to tell us his story. On meeting Godfrey for the first time in 2010 we found a very tough, resistant young man but there was something about him that touched our hearts. Apparently we should have been afraid of this street kid, with his bold attitude and ‘I don’t need you; you’re just another Muzungu (white)’ approach. What we were to learn is many small on the ground organisations fail due to mismanagement and the real victims naturally are the children. The children have no voice, but more importantly no choice but to take whatever support they can get from whoever is offering. 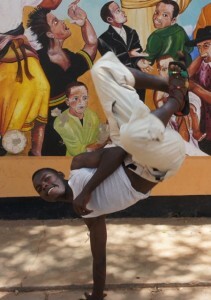 These same children are often taught to ‘put on a show’ for the Muzungu visitor, a show when the muzungu is around to prove the organisation is fully functioning and happy. The children receive food, shelter and rewards for such a display. They are threatened with the choice to play the game or stay on the streets. What we saw in Godfrey was survival at it’s most basic but we didn’t know it at the time. He had seen the likes of us before, the whites come in, help for a bit then it fails so they leave. But we were different, we had promised these boys we would not abandon them –we knew at the time this was a huge commitment and did not realise the journey we were about to take. Shalom had it’s work cut out and what KIN had left behind was a rundown, dysfunctional home for 22 boys. 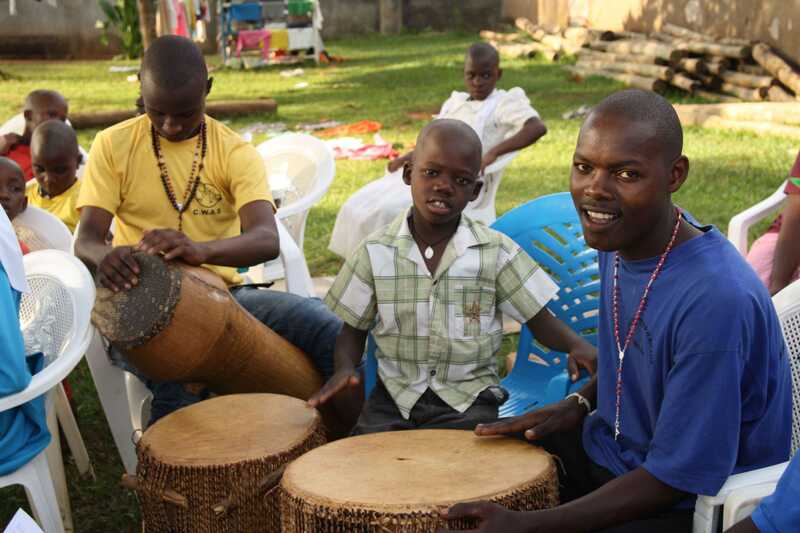 On seeing the state of the orphanage in the slums of Kampala in 2010, we committed to extra monthly funding and some capital input to bring the place up to scratch. Trusting things were moving on well and not aware of the charade we had witnessed we planned our second visit for 2012. We were devastated to find Shalom had not changed. Two years on things still looked in the same terrible state. We knew something was very wrong. So planning surprise visits in the July was to prove Shalom Charity Foundation was also failing due to mismanagement. We were so disheartened, and reached out to others to take the boys out of this situation. ChanCes Charity began around this time because now we were like the guardians and we needed to take responsibility. We had committed to 22 boys we would help them find a way out of poverty through our involvement. Not only did we have to prove we were honorable to our word but now we had a strong emotional bond and were determined to show them hope, honesty and above all love. After all that is what we had offered them back in 2010. 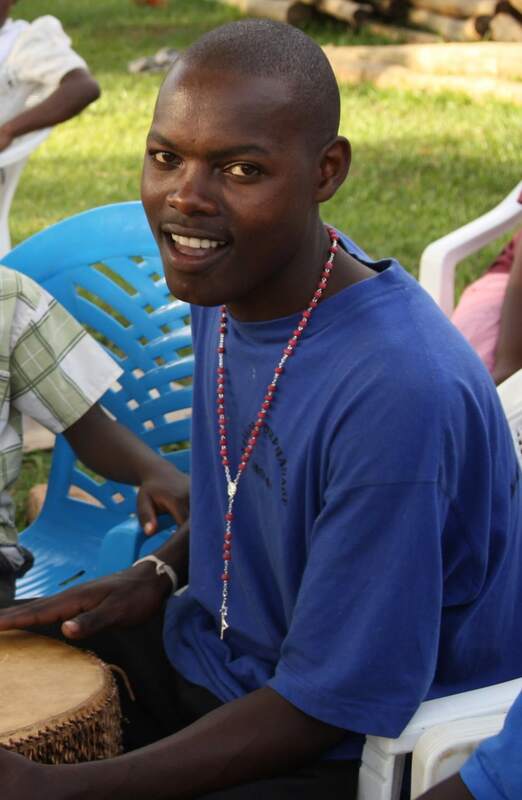 Godfrey is now in Senior 2 at boarding school and hopes to be a journalist one day.